Kids are full of energy and they love to play. In fact, it’s important for children to get exercise outside on a daily basis. Sometimes this energy can get the best of them. We all know that kids are full of imagination and enthusiastic about playing games, but sometimes they get a little carried away. 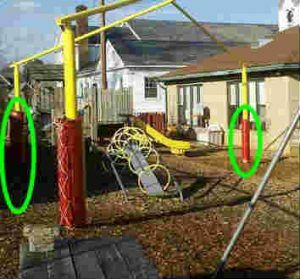 While playground shades are necessary to provide children with protection from potentially dangerous over exposure to the sun, the hard metal posts supporting the shades should be padded. 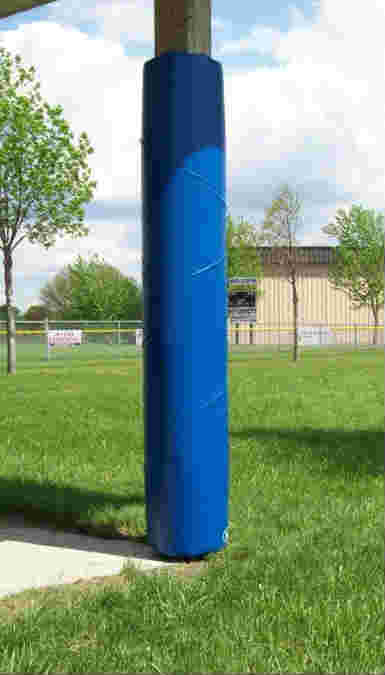 The easy solution is to add quality, protective post pads around the poles of your playground shades. Md Material post pads and pole pads are abrasion resistant, waterproof, resistant to UV rays and they will not rot or mildew. Our pads are also easy to install and highly durable. Why do you need playground Pole Pads and Post Pads? The main reason is SAFETY,which should be the priority of any playground. Our playground post pads and pole pads will give you the peace of mind to know that your children are safe when they are on the playground. These pads provide real protection from the danger of collisions with a rigid metal post. Made from 14-ounce vinyl, these post pads are the same strength as the padding found around football goal posts and basketball poles. That’s right! The same type of material that protects football and basketball players will also be protecting your children! You can also see from the photo above that the height of each pad provides ample protection for rambunctious children. Choose between velcro or tie-on attachments for your pads. Our post pads also come in a variety of colors, sizes and thickness to match the needs and design of your playground. Our post pads not only prevent collisions, but they can really add a decorative look to your playground. We also offer post pads in animal prints, which young children love! You can choose between leopard print, cow print, tiger print and more! If your school mascot happens to be an animal, then you can display your school spirit on each post pad! Sizes available: several heights and diameters are available. Custom sizes are also available. Call us at (877) 840-0707 to inquire about sizes. When the action heats up on the basketball court, it is important to have pole padding. 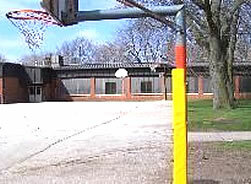 Add a velcro or tie-on post pad around each basketball pole. Our basketball pole padding wraps around the post on 3 sides. Post pads are available in solid colors or can be embellished with your text as an additional cost. If you need a safe post pad for your basketball pole or playground shade, Contact us today! You may also fill out the contact form to the right or call us direct at (877) 840-0707.